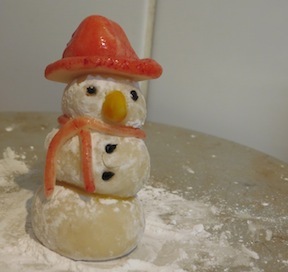 This section is all about edible Christmas crafts with recipes that kids love to make. 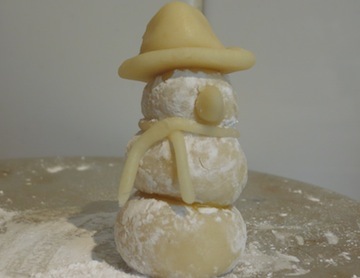 Christmas is a wonderful time of year to spend at home baking yummy things to enjoy, and we hope you enjoy some of our edible ideas including our marzipan snowmen, lots of pretty Christmas biscuits, and the sweetest pink sugar mice! 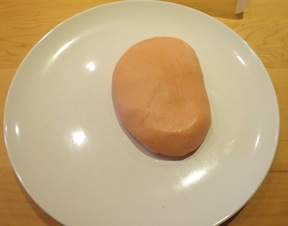 A block of marzipan - you probably won't use it all, unless lots of kids get involved. 2. 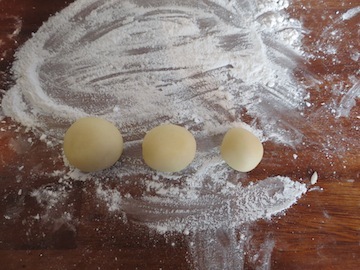 Roll out three medium size balls of marzipan, each one slightly bigger than the last. These are to make the two body parts, and the head. Our largest ball measured about 4cm in diameter. 3. 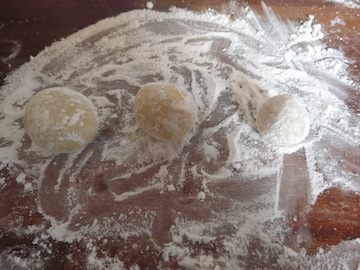 Next roll the balls in icing sugar so that they are well coated. 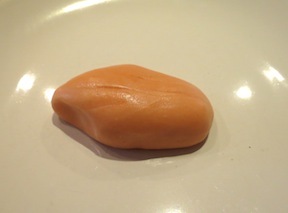 Nose: Roll a small carrot-shaped piece of marzipan out. Don't make it too big or it might fall off! 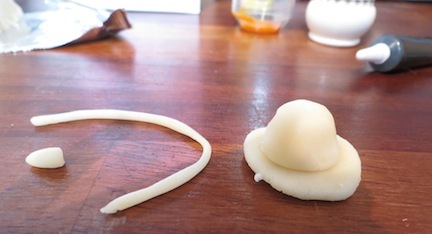 Hat: Roll out a piece of marzipan the shape and size of a fruit pastel. 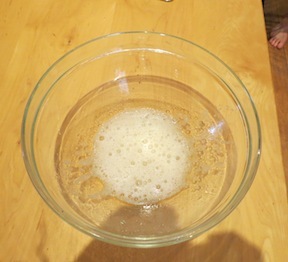 To do this make a small ball, press down the top and bottom, and gently flatten the sides. Scarf: Roll a long (about 10cm) piece of marzipan, rolling it to get thinner from the middle outwards. 5. Now it's time to stick the pieces together. Dip your paintbrush in water and stick the three balls together first, the smallest for the head on top. 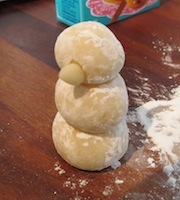 Then add the nose with water and also the scarf. 6. Finally, with some water stick together the two pieces that make the hat and with then gently press that on top of the head. You are now ready to paint! 7. 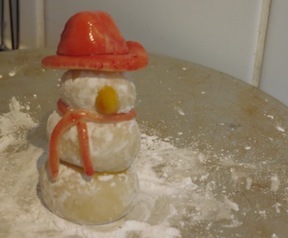 Mix a very small amount of red food colouring onto your paint brush and gently paint the scarf and the hat red. Do the same with the yellow for the nose. Next, use a cocktail stick to make small holes where the eyes and buttons will go. Then take your black writing icing stick and squeeze a *small* amount of icing into the holes. 8. Finally, break a cocktail stick in half and stick one piece into the sides of the snowman's upper body. 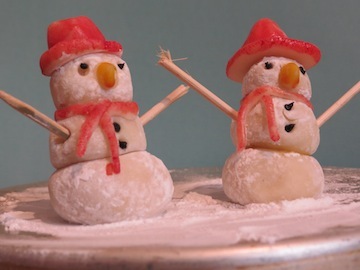 TIP: These snowmen are a great edible Christmas craft. What about using them to decorate the top of your Christmas cake this year?! 2. 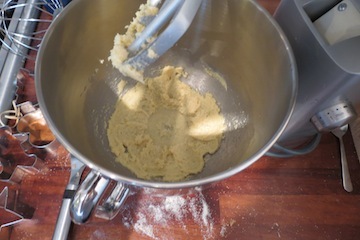 In an electric mixer beat together the butter and the caster sugar until creamy. 3. 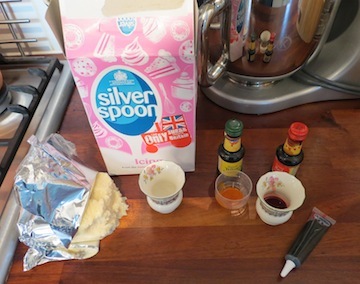 Sir in the bicarbonate of soda, golden syrup and the egg. 4. 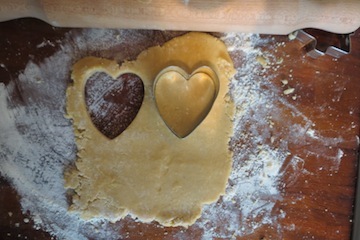 Sift in the flour, cinnamon and ginger and bring together with a wooden spoon. 5. 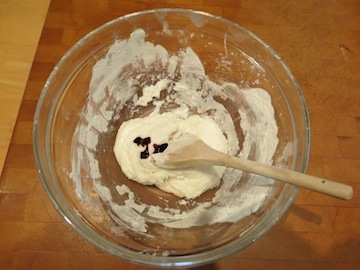 Using your hand, form the mixture into two balls. Wrap in cling film (plastic food wrap) and put in the fridge for 15mins to cool. You can use this time to clear up a bit and get your decorations into bowls. 6. 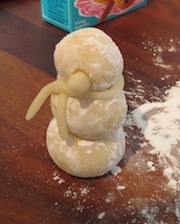 Sprinkle some flour a work surface and roll out one ball of dough to about 2.5cm thick) - this does not really matter. Just make sure its not so thin that you can't lift the shape off the table onto the tray! 7. 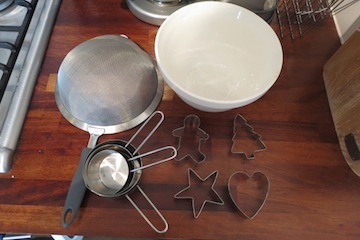 Take a cookie cutter and cut out different shapes. 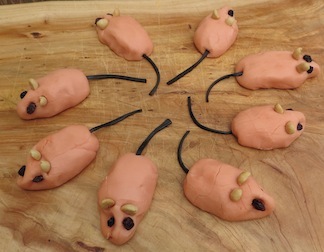 Gather up the scraps and mould them into a ball to roll out again. 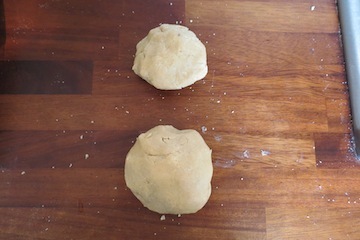 Once you have used the first ball of dough up get the second one out to use. 8. Grease two trays with some butter and lay your cookies out on the trays. Bake in the oven at 180C, 350F, or Gas 4 for 10-12 minutes until golden brown. 9. Now for the decoration! 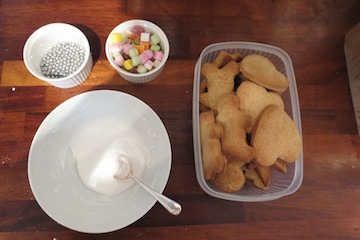 Mix 1 cup of icing sugar into a bowl and add 4 tsp of water (no more). Mix until a thick paste. 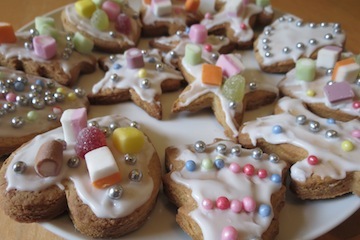 Spread the icing onto the cookies and sprinkle decorative sweeties ontop. 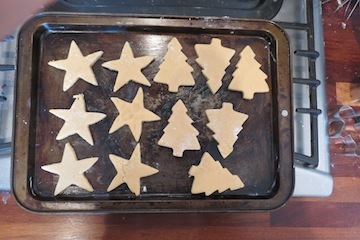 They don't have to be perfect, they look and taste great whatever you decide to do.....The most perfect edible Christmas craft!!! 4 shelled peanuts broken into 8 halves. 1. You will need a baking tray with parchment (don't cook them, it's just to dry them on), a large bowel, a whisk, sieve and wooden spoon. 1. 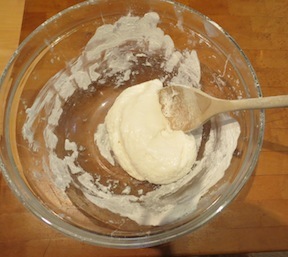 Whisk the egg white in a mixing bowl until its frothy, but not stiff. 2. 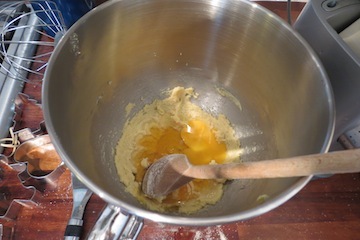 Sift the icing sugar into the egg mixture and stir until the mixture is stiff. 3. Add a few drops of food colouring. Use only a drop or two to start with - you can always add more if needed. 4. 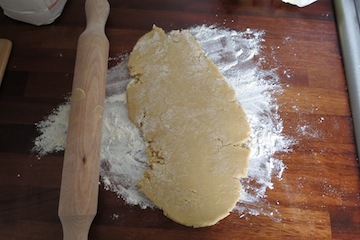 Stir in the food colouring and knead the mixture into a dough. 5. 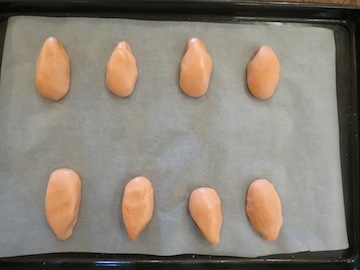 Divide dough into 8 pieces and shape each piece into an oval with your hands, pinching one end to make a pointed nose. 6. 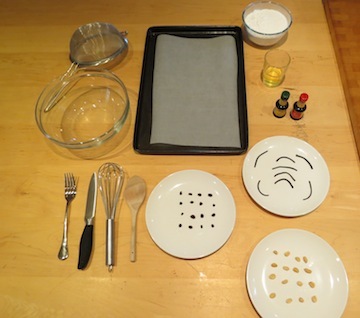 Do this with each piece and lay them out on the baking tray. 7. Finally, gently press two currents above the noise to make eyes, two peanut halves above the eyes for ears and a liquorice string for the tail. 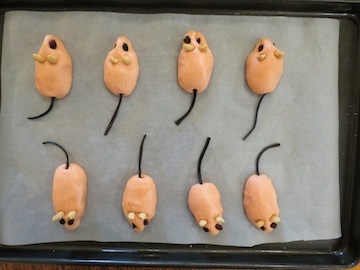 Let them dry out, preferably overnight, on the baking tray. 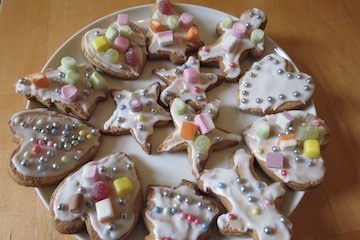 We hope you have enjoyed our edible Christmas crafts? We will be adding more so do keep coming back to check. Looking for more ideas for homemade Christmas decorations or Christmas card ideas for kids? Why not try our ideas for Felt Christmas Ornaments, an Orange and Clove Pomander or Easy Homemade Christmas Cards?